For a winter wedding you can opt for a formal, professionally-coordinated red wedding bouquet of fresh seasonal flowers like red lilies. For a summer wedding that's casual and young, capturing the spirit of the season comes easy with a vibrant red roses wedding bouquet. Offset these with white stephanotis for an eye-catching effect. This style works especially nicely for a red rose bridal bouquet wherein the buds are tightly bunched together in a circular pattern, as determined by the Swiss origins of this arrangement. 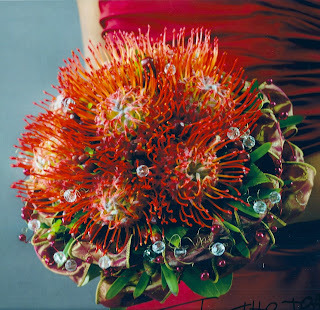 The red Biedermeier bouquet may have a variety of red-hued flowers for each ring, as opposed to the multicolored effect of the original 1800's style. For contrast, you can add in a white or cream lace or silk ruffle under the bouquet's outermost ring to really set off its dramatic quality! Red Calla lilies are amazingly striking wedding flowers that can set off your wedding dress with their vibrant and exotic appeal, especially if you're planning a beach or outdoor wedding! Or, you can opt for Plumeria crimson and Lilies of the Nile in a reddish shade. Hand-tying is especially easy, too, if you're good at crafting and adding bows. Twist some craft wire or clear synthetic thread around trimmed stems, then casually loop a few satin ribbons and tassels to hang down from the knot of the bouquet. There! You've made it look magical in just a few minutes. You can buy light shades of white, pink and orange Gerbera daisies you can tint at the tips with deep red color. Surround these lovelies with dark red Gerbera daisies for a stunning monochromatic look to your wedding bouquet. You might remember your Nana using clove pomander balls in her wardrobe for adding fragrance to her clothes. You can use this clever old-fashioned method and also give your wedding dress a welcome boost by arranging your favorite red flowers - Petunias, Roses, mini Calla lilies, Orchids etc. - in a kissing ball bouquet, similar to the pomander look. It's old-worldly and completely charming! Purchase a long string of faux seed pearls and loop these around your red wedding bouquet for a truly uptown look. Or, embellish the blooms in your bouquet with blingy accents like rhinestone picks, diamante butterflies, glue-on beads or even red berries hung in short strings from decorative gold tassels on the outer floral ring of your bouquet. If you've picked red flowers for your wedding bouquet, draw attention to this remarkable, passionate color. Give them a fresh and dewy-wet look by spraying some sparkle mist on them, which you can find at the local party store!